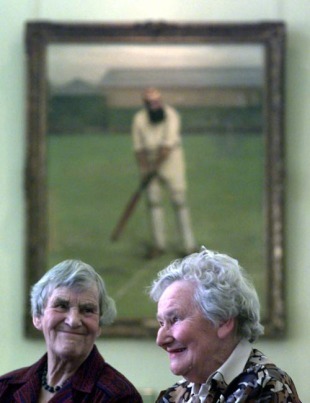 Audrey Collins OBE, one of the towering figures of women's cricket in England, died on Valentine's Day aged 94. As a tribute to her lifetime contribution to the game, there was a one-minute silence at the start of the first ODI between India and England women, and the England team wore black armbands during the game. Born in India in 1915, Collins' father was killed in the World War One, and her Australian mother decided to bring her three children to England in 1920. She played her first match aged 12 and went on to represent a number of teams, most prominently Middlesex and the South, before playing her one and only official Test against Australia in the 1937 Ashes. In the drawn Test at The Oval, Collins scored 27 in the first innings batting at No. 8. She put on 54 in half an hour with Betty Archdale, after the pair were told to "get on with the job". Collins moved to St Albans after the World War Two, played for the East and became secretary and later chairman of the Women's Cricket Association. Her term as WCA president, from 1983 to 1994, was the longest in the history of the organisation, which eventually merged with the ECB in 1998. She was also one of the first ten female members admitted by the MCC when it voted to allow women to join the club in 1999. In later years, Collins was best known for her services to various chocolate firms in her unstinting efforts to raise funds in continued support of women's cricket.